Most of the time when I hear that a restaurant is known for great Prime Rib, I expect good...not great. Half of the secret to great Prime Rib is knowing how and where to buy it from. The other half is the right preparation, it's aging, seasoning and for some master chef's "infusing" secret seasoning into the meat while aging. The Prime Rib dinner I had at Peter's Steak House in Iselton this week had that something "special" about it that made it the best I have had in many years. Family ran, Peter prepared my meal personally as I chatted with him in the back kitchen. The Kitchen was spotless, and from an old restaurateur's eye, very organized and efficient. 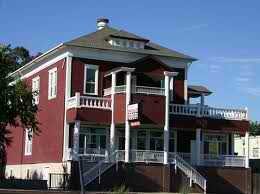 The three story remodeled building with wrap around decks and porches is very beautiful, and done with taste as is the interior design. Many Delta and historic restaurants go for the "over antiqued cluttered memorabilia look"..but Peter's Steak House has that tasteful spartan feel one sees in old western photographs of an elegant hotel lobby and dining room, minus the pretentious white tablecloth and china. The Bar is small but part of the main room, and thus is complimentary to the dining experience rather than a separate loud distraction that many area establishments offer. With booths or tables available and an incredibly high ceiling, spacious and inviting, this is the place for "agoraphobics" like myself. which I was tempted to order but I had heard so much about the Prime Rib. I ordered the petite cut (more than enough) of the Prime Rib dinner at $17.99 with creamed corn and baked potato w/ sour cream. Peter's own blue cheese dressing was delicious over a garden salad, with fresh mixed greens, tomatoes, grated carrots, sunflower seeds etc..
My first taste of the Prime Rib after my eyes confirmed the quality of the marbling and textured consistency, and more-so immediately determined it was worth the drive and made my day after interactive 'doings' everywhere with mediocrity. The key to a great day is to find excellence to anchor your faith in the ideal that "life is good." I knew better than to ask his secret of his "seasoning rub and other recipe ingredients, as I never give mine away. I ordered my cut medium rare, and it was done perfect. Every bite had me in audible expression of delight where I am sure my fellow diners thought a bit odd... as I dined alone. Served with really fresh and pure horseradish "paste" I alternated with, and without as it was almost sacrilege to even dip into the awesome Au Jus sauce. The creamed corn was homemade and a deliciously fresh texture, not the usual overcooked style. My potato done just right. For dessert, you must try Peter's bread pudding with coconut ice cream, his rivaled my mom's and I can't give a better compliment, and his pairing it with the coconut ice cream was a brilliant infusion of Americana-Pacific Rim blend. 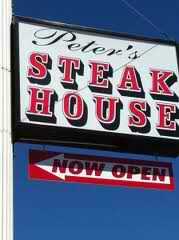 No Comment to " Peter's Steakhouse in Isleton - Family Run Place Serving up Great Prime Rib "